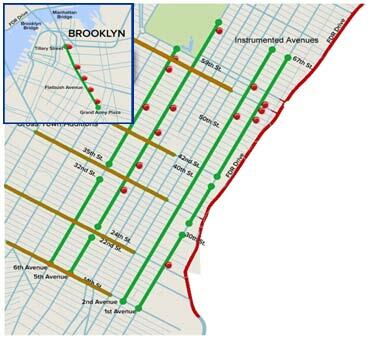 NYC is one of three Connected Vehicle (CV) pilot deployment sites selected by USDOT to demonstrate the benefits of this new Connected Vehicle technology. The other sites are in Wyoming, which focuses on interstate routes and commercial vehicles, and Tampa, which will be testing a number of applications in a mid-sized urban environment on a relatively small number of vehicles. The goal of this project is to show that the benefits justify the sustainability of the operation and will encourage others to outfit their vehicles thus increasing the benefits to all. In fact, the National Highway Transportation Safety Administration (NHTSA) has begun a rulemaking process that will require this technology on all new vehicles sold in the US. A large US automobile manufacturer has already announced its intention to include this technology in some of its new models in 2017. The project is divided into three phases. The first phase, completed in September 2016, was the planning phase. It included a concept of operations, system requirements, safety plan, benefits evaluation plan, security management plan, and deployment plan. The 2nd phase (20 months) began in September 2016 and includes the detailed design, field equipment development and procurement, software development, integration and the installation of the in-vehicle devices and the roadside infrastructure. The 3rd phase is an 18-month operating period during which the applications will be active and providing alerts to the drivers. As part of this project, the City plans to install the CV technology in approximately 8,000 vehicles which frequent the streets of Manhattan; this includes approximately 700 MTA buses, 5,000 City vehicles (DOT, DSNY and DCAS), and 1,000 yellow taxicabs. These fleet vehicles represent about one million miles of vehicle travel per day! 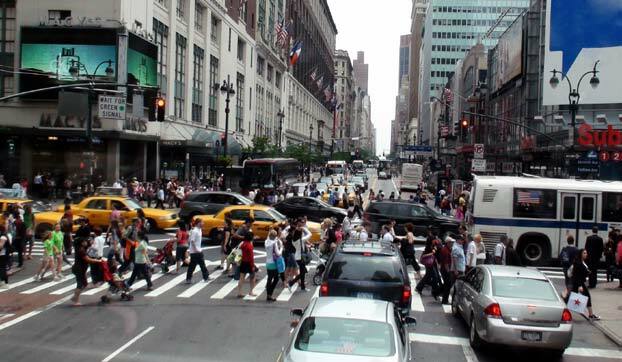 The NYC Pilot Project will provide an opportunity to experience a density of vehicle interactions never previously attempted with Connected Vehicle technology! RSUs will also be installed along portions of FDR Drive to support applications such as curve speed warning and over dimension vehicle warnings (over height and prohibited commercial vehicles). CV technology uses GPS location information which is augmented by other means to improve its accuracy. Each vehicle determines its position and time from the GPS signal. The vehicle then broadcasts (at approximately 10 times per second) its current position, where it has been (path history for the last few seconds), and its current heading to all nearby vehicles. At the same time, each vehicle processes the messages it hears from the other nearby vehicles and identifies potential hazardous situations. Then, based on the crash potential, it alerts the driver of the possible crash so that the driver can take appropriate action. In a similar fashion, the vehicles receive information from the traffic controllers that is analyzed by the vehicles to alert the driver of an impending red light violation in order to reduce the crashes at intersections. The City is also working with a number of pedestrian advocacy groups and will be deploying two pedestrian-oriented applications. 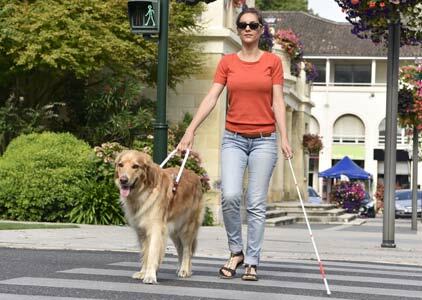 The 1st supports the visually challenged by using the geometric information about the intersection and the signal timing information transmitted by the intersection to assist the pedestrian in crossing the street. The 2nd is traditional pedestrian detection technology which will be able to determine if there is a potential conflict between an approaching CV equipped vehicle and the presence of a pedestrian in the crosswalk. Finally, the City’s deployment will include a configurable data collection application that will be used to evaluate the benefits of the system and allow USDOT to perform additional evaluations of the overall system operation. New York City is shaping the future of Connected Vehicle technology and making our streets safer for both drivers and pedestrians!